Way back in the day (which means either in the 60s or 70s for folks my age), I once had a portable record player. [BTW, those who remember what an actual record scratch sounds like will truly be disheartened when they read this article by David Pogue describing what’s happening to the analog sounds of yesteryear.] My player was one of those very small plastic models (it even had a handle… natch). Now, we’re not talking about anything close to what the audio geeks of the time would refer to as a turntable. Those devices, with their discretely engineered platters (with either belt or direct drive motors), tone arms, and exotic cartridges, were not yet in my league. No siree. Turntables, and the stereo components required to run them, wouldn’t make it into my price range till I was out of my teen years (and actually had a J-O-B). Still, I played many a vinyl record (the 33⅓ and 45 rpm variety) numerous of times on that little number for years before it gave up the ghost. But when the time came and I was about to move up and retire that worn midget player of mine, I can still recall the album I was in the midst of wearing out at the time. 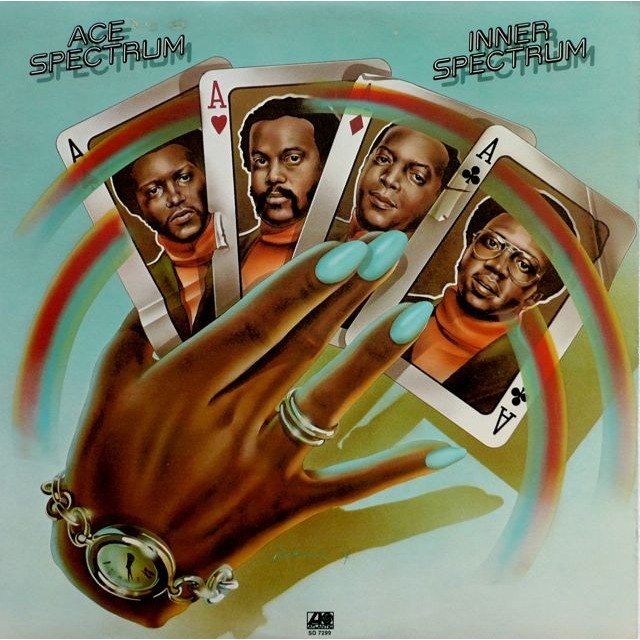 It was the Inner Spectrum LP by Ace Spectrum which debuted in 1974. This was that fondly remembered 70s soul quartet’s first album on the Atlantic Records label (and still their best effort, IMO). The group wouldn’t stay together long — not helped by their revolving membership — Low Rent Rendezvous and Just Like in the Movies would constitute the remainder of their small album discography. Still, Inner Spectrum was a great album characterized by a distinctly sweet and smooth sound by these singers (think more ‘Philly’ than Detroit Motown). Plus, it had one of my favorite album art of the day (the only time I think turquoise nails were ever or better deployed for a vinyl record cover). While it had a number of substantial tracks to offer the listener (their soulful cover of James Taylor‘s Don’t Let Me Be Lonely Tonight being another notable), my favorite track remains this post’s forgotten song. The legendary singing and songwriting duo of Nicholas Ashford and Valerie Simpson wrote Don’t Send Nobody Else. Then and now, that gives it a wonderful pedigree. So much so, this song was covered by The Dynamic Superiors a year later in ’75 (with some popularity). Regardless, in my book only this version by Ace Spectrum keeps me coming back to the song decades later (even though I had to get the Japanese CD import to do it). At their height, they made it worth remembering. Enjoy. Do you know, I love the sound of record scratches and crackles? I also like the squeak of guitar strings. Music connoisseurs shudder when I say this but tis true. I know what you mean. You know a real human being was behind it all. Thanks, Rachel. My plastic record player was green. I could only get 45’s until my aunt bought me Carole King’s Tapestry. I went crazy after that (my Mom thought so too) buying soul, funk, and southern rock albums. Ahhh the good ol’ days. Wonderful memory! Mine was blue (now if only I could remember the manufacturer). But it sure was the center of my world for a bit and generated some fine musical memories. Thanks for adding to this with your comment, Allison. My first record player was a portable plastic Fisher Price model that I got as Christmas present at the age of about five. I remember being obsessed with the cover of The Beatles “Magical Mystery Tour” lp and playing the Chipmunks Christmas record every December. Thanks for the song, I don’t know if I had ever heard it or of Ace Spectrum for that matter, I love the soul/R & B music of this era, and heck, I still listen to vinyl! Yeah, there was a lot of great R&B music in that era. Not surprising you hadn’t heard of Ace Spectrum as they weren’t around for long. But, they were good when they were. I envy that you still listen to vinyl — I still some LPs, but no turntable! Argh! Thanks so much for your comment, Kevin.